Emboldened by my recent watercolour purchase from Sabrina i thought i’d search or “Original Millennium Falcon Art For Sale”. 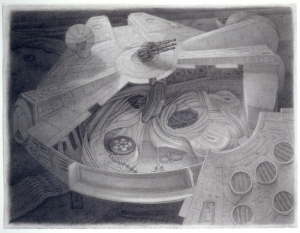 Truth be told, there wasn’t much there except this still life of a Hasbro Millennium Falcon simply called “Millenium Falcon 1986” which is part of an autobiographical set of works. It’s nice t think that there are professional artists who have also been raised on Star Wars. This entry was posted in Art, Things that i don't have yet... and tagged Art, Gerald Davis, Millenium Falcon, Millennium Falcon, Star Wars. Bookmark the permalink.